Dine at PRIME on Valentine's Day! Enjoy a three-course Meal for $75 pp & receive a special gift. Enjoy a four-course meal that includes a champagne toast followed by Belly Dance Shows! Enjoy dinner with a view at Deck84's Valentine's Day Dinner. Stop by Salutations of Delray & get Agaria Candles, diffusers & scented tassels for 1/2 off until February 14th! Don't forget, Salutations has the perfect card for your special someone! Bring your Beau (for FREE) to the Barre! Come to Barre Envy & show your man how it's done. Reservations are limited, so book in advance. All reservations need to be made by February 14th! Enjoy a special menu for Valentine's Day at Le Sorelle! 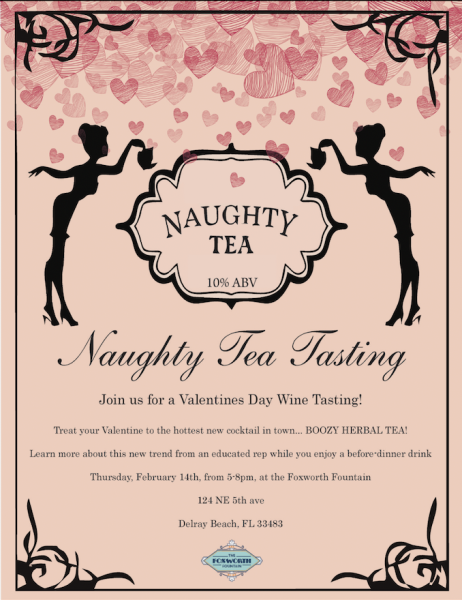 Treat Your Valentine to the hottest new cocktail in town—Boozy Herbal Tea! LOVE IS IN THE AIR.....OR IS THAT POPCORN? Looking for that perfect gift for your Valentine? Our gourmet popcorn is Even Better than traditional gifts that can spoil over time. Buy any size TIN for your valentine and get a gift for a FREE mini! Package Specials! (must be purchased by 2/20/19) Buy a 10 Pack and receive 1 FREE YEAH! Buy a 15 Pack and receive 2 FREE WHOOPEE!! Buy a 20 Pack and receive 3 FREE WOOOOHOOOO!! !